memories, have more fun, and truly experience your destination! ALL BOOKINGS ARE FREE FUN ELIGIBLE...explore the link below! + 10% OFF Extra if you Reserve within 10 Days of Checkin! Save your money on a rental car - you won't need one here! 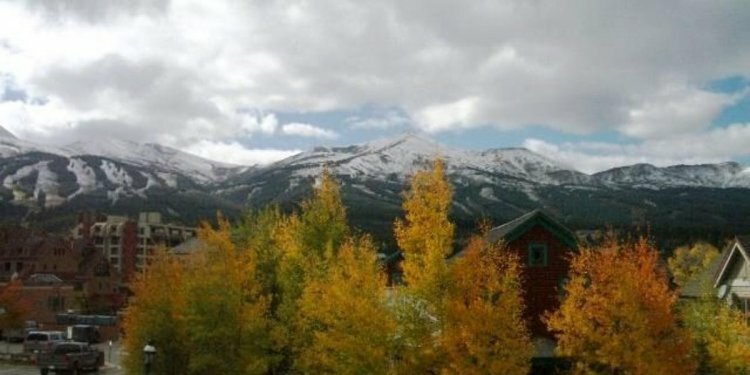 The stop for the FREE Ride is just outside your door in the ski season (in the summer it stops a few blocks away), but it may be easier to just walk the 400 feet to Breckenridge Brewery, or any of the other hundreds of shops, restaurants and bars in the Peak 9 base area. By far the biggest and best base area in Breck, you have it all right here! And you can see Peak 10 from the Master! This cozy, chic 3 bedroom + loft hideaway has 2 master bedrooms (with private baths!) a spiral staircase, luxurious furnishings and a perfect location! Sleeps 8 in 3 beds plus bunk bed in loft. This kitchen was redone in 2012 with gorgeous materials, and is large enough for a team effort at mealtimes. You're always part of the action with open floor plan to the great room. Shorter stools on the kitchen side and longer barstools on the living room side enable 8 to eat very comfortably. New carpet was installed in downstairs bedrooms in the summer of 2015. Kids can hang out in the spacious loft and watch TV. You're right next to Carter Park, with extensive hiking trails, tennis courts, and playground at Breckenridge Elementary, adjacent to Carter Park. You have a covered, heated parking space, free firewood, and High-Speed Wireless Internet. You're walking distance to everything crucial (grocery, ski rentals) OR you can always take the FREE ride since the stop is just outside your unit.